I hadn’t even heard of the Fitzwilliam Museum until I started researching what there was to do in Cambridge online. The museum got really good reviews on Tripadvisor. And, like many other museums in England it was free, so I figured we should at least check it out. Let me tell you more about our visit to the Fitzwilliam Museum so that you can decide if you should go too. The Fitzwilliam Museum is in an impressive building in the same style of the British Museum. I love the massive columns in the front. We arrived right when the museum opened at 10 am and were the first ones there. We didn’t have the whole museum to ourselves for long, but it was never too crowded. The exterior of the Fitzwilliam really reminded me of the British Museum. The museum holds the collection for the University of Cambridge and they recently celebrated their 200 year anniversary. The collection is pretty diverse including paintings and sculptures, ceramics, and coins. The time period of the pieces ranged from ancient Egypt to modern day. We spent a little more than two hours exploring the museum. One of the beautiful sculptures on the balcony in the entry hall. Most of the top floor was beautiful European art. The balcony in the entry room, had several gorgeous marble sculptures and also a nicely decorated Christmas tree since we visited in December. Then we wandered into the rooms, which were set up beautifully. Many of the rooms had furniture pieces that were also works of art. I also really liked the rooms that were painted red. There was one room that had a balcony with more artwork, but it was also nice just to look down at the room below and admire the decor. My favorite part of the museum though was the small but significant collection of more modern art, specifically the impressionist works. There were some lovely Monet, Seurat, Cezanne and Renoir paintings and also some sculptures from my favorite artist, Rodin. They also had some nice even more modern pieces. A sample of the modern art at the Fitzwilliam. At the stairway, there is a replica of the Angel of the North sculpture. You can find the full-size 66-foot tall version, designed by Anthony Gormley, just outside of Newcastle, England. Downstairs they have an interesting collection of coins and also ceramics. The rooms with ceramics were full of so many beautiful items, we did not have time to look at them all! They also have a nice collection of Egyptian art and artifacts as well. If you are hungry, you can find the Fitzwilliam Museum cafe next to the gift shop. So many pieces to see! 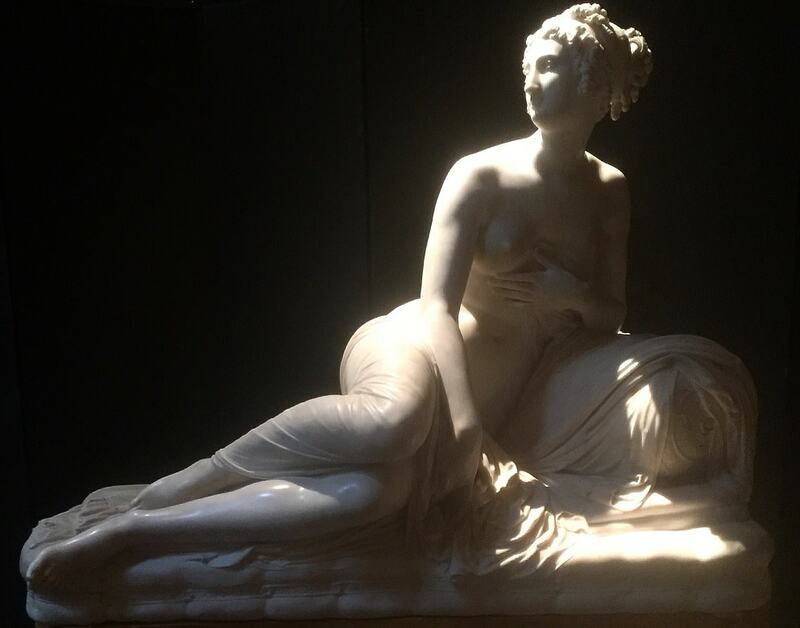 We spent about two hours at the Fitzwilliam Museum and really enjoyed it, so I would definitely encourage you to check it out even if you are just doing a day trip to Cambridge. 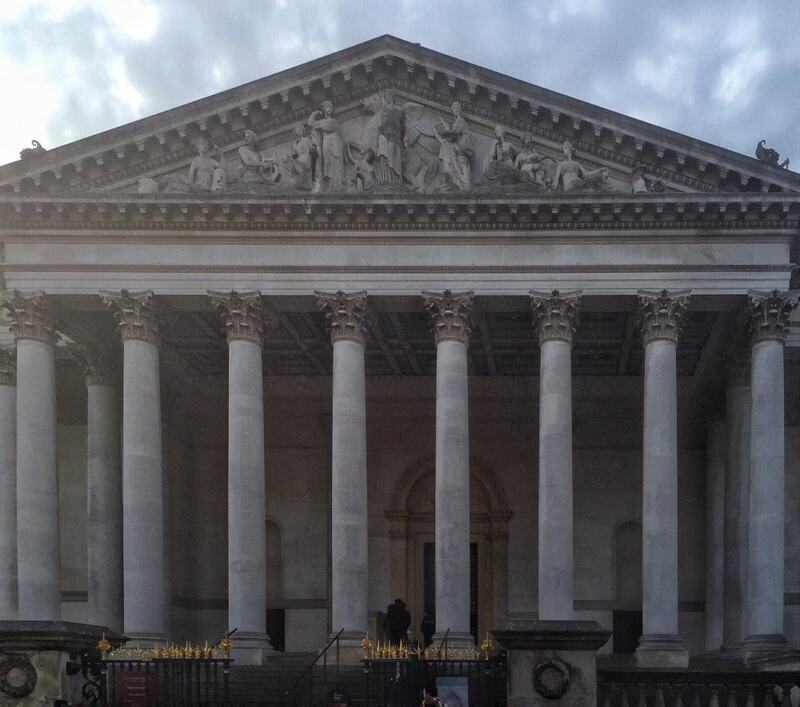 Have you visited the Fitzwilliam Museum? What did you think? The Fitzwilliam Museum Cambridge is always free! There is a gift shop and cafe in the atrium downstairs. When visiting Cambridge, be sure to go punting on the Cam and visit the Cambridge American Cemetery. If you have time, there are also many places near Cambridge that are worth visiting. Parking can be an issue in Cambridge, so try to take public transportation. We are happy to co-host the Weekly Postcard Linkup. Everyone is invited to join us and share their travel blog posts here beginning at 12 p.m. (PST) / 8 p.m. (GMT) Friday November 4th. The instructions are below, but if you have any questions, feel free to reach out to us. Happy Travels! What a cool museum! Love the architecture of the building. The architecture is beautiful. All the details remind me of Sagrada in Barcelona! Thanks. To me it was like a mini British Museum. Thanks Sarah. Happy to share the info. 200 year anniversary?! WOW! Sounds like so much amazing history is there! Yes Lena. What is considered old here just doesn’t even compare. Sometimes its hard to comprehend the history! We have lived in England for 50 years and never visited Cambridge! If we do this will be on the list! Oh my! You really should visit, its such a lovely place! I’ve never heard of the Fitzwilliam Museum but I love the diversity of the collections! 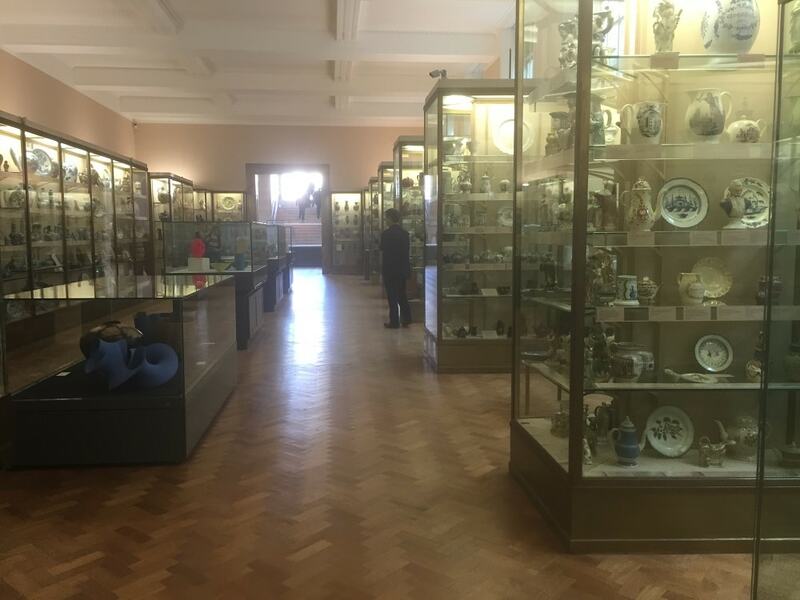 The room with the ceramics looks like you could spend so much time browsing. Monet is my favorite. Emily – Yes I hadn’t heard of it either before I started researching. It really does have a diverse collection with lots of pieces. I really like Monet too. Angie! You will love Cambridge so you really must go. I think you guys would enjoy the punting too. Glad to hear that Jessica. I think you will really enjoy it! looks great ! I visited Cambridge before but I didnt visit any museum! Hopefully next time! Thanks! Yes, the Fitzwilliam museum is great, hope you make it back to see it next time. This museum looks really cool! And the fact that it is not too crowded is a huge plus! 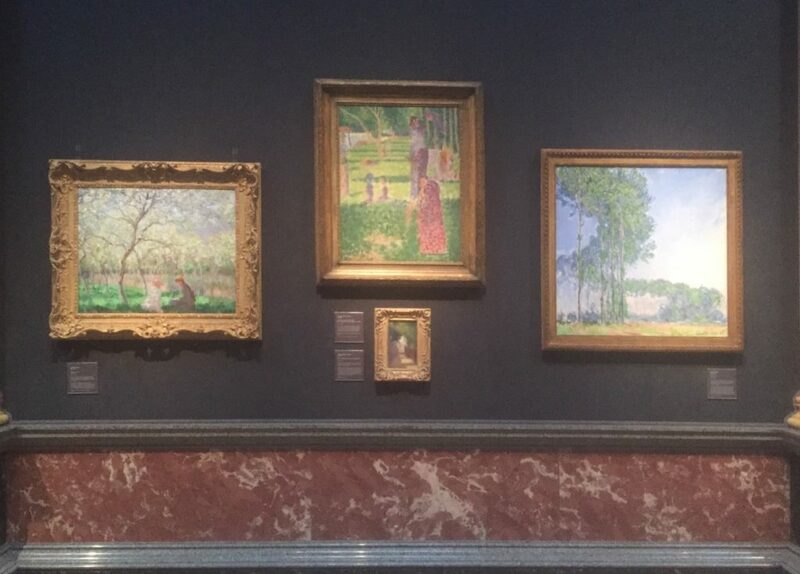 I also love the impressionism, would definitely not miss this collection! Thanks Anna. Yes it was really nice that we didn’t have to fight the crowds. I hope you get to visit! The British Museum is my all time favourite museum! Although now I’m kicking myself that I didn’t visit the Cambridge Museum while I was there! It looks like it’s well worth it. Kat – Agree the British Museum is amazing and this one did remind me of it. Its much smaller and the historical pieces aren’t as significant but it is definitely worth a visit next time you are in Cambridge. I love it when art museums are free, especially traveling with a child. Sometimes they’ll spend 2 hours in a museum if something engages them and sometimes they’re done in 20 minutes. so a low/no ticket price lowers the risk and makes us more likely to try it. Eileen – Yes that’s very true. I wish more museums here were free! Liz – Yes! I hope you get the chance to visit! 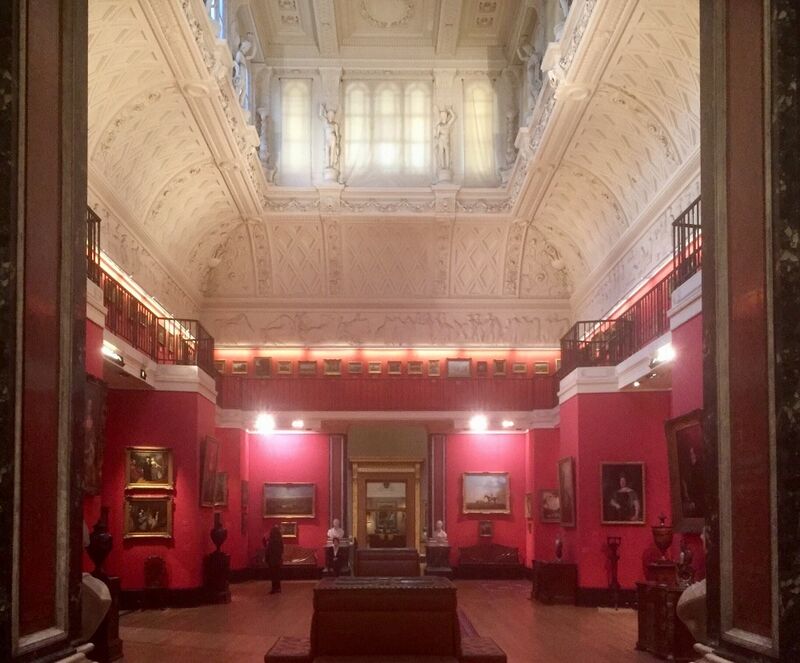 Yes, the Fitzwilliam Museum certainly looks like a smaller British Museum… which I and my kids really love. On average, every second trip to London we visit as a family. The red room would most likely be my favourite as well. Annette – Very nice, yes there is so much in the British Museum I’m sure you keep learning more each trip. I’ve spent a lot of time in Cambridge, as it’s where Rich did his PhD and also where he and Sue got married. Nice I love Cambridge its so pretty! Thanks so glad you enjoyed the post.